It’s not everyday that you have an opportunity to break bread with complete strangers, but that’s exactly what I got to do last week. 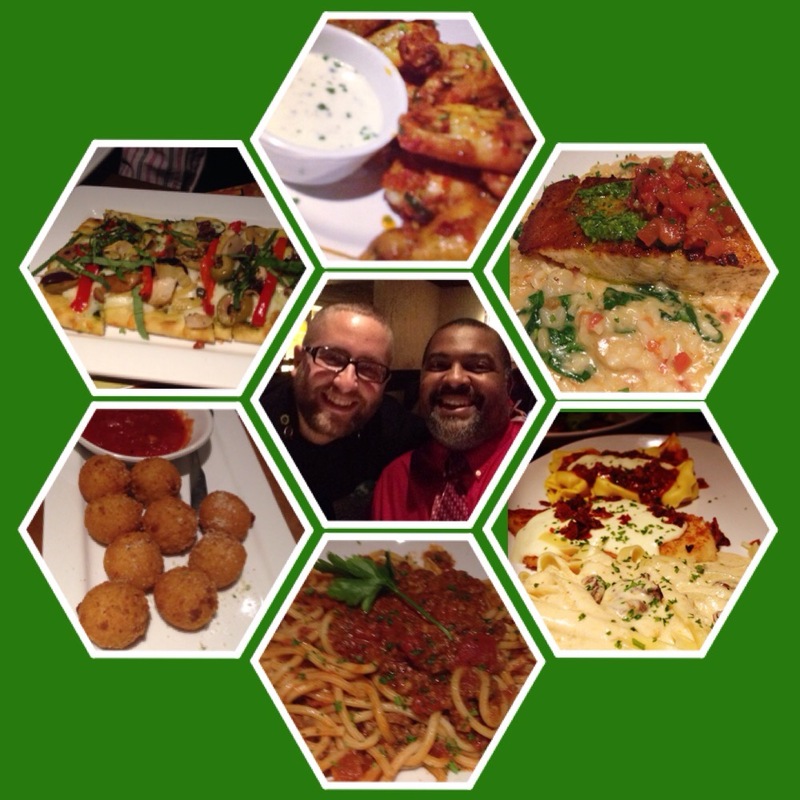 I received a special invitation to visit the Olive Garden in Greenwood, Indiana (one of the oldest original restaurants in the popular chain) to check out their latest remodel – both of their building and their menu. Don’t worry, the bottomless bread sticks are still there. Nobody is touching those. I was told ahead of time that this was the most significant menu evolution in the company’s history. The new tastes include over 20 new menu items with the intent to offer more options to customize both the lunch and dinner experience to fit the evolving palettes of guests. Basically, this was a fancy way of saying “We’ve got something for everyone.” And trust me – they do. The interior design has changed as well. They have updated everything from the lighting to counter tops to the flooring. The floor plan is very open, but not overwhelming whether you are dining with a large group or that special someone. I had no clue what I was in for. When I entered the establishment, I was greeted and invited to find a seat at any table in the reserved area. The funny thing about social media is that even though you may follow, retweet, or tweet someone – it is quite possible that you wouldn’t recognize them if they were sitting 5 feet from you in real life. Thus, I found myself replicating my middle school years navigating amongst people and hoping to find myself in a comfortable situation. And I did. There were over 30 people in our preview party, 6 of which were seated at my table. In regards to the layout of the room, it was very pleasant, I didn’t have to yell at my table to be heard, we all had comfortable and casual conversations, but I never felt like any of the other tables were impeding our experience. We were greeted by the general manager of the restaurant, Greg Tuzzio, who has been working at Olive Garden since the age of 18 when he started as a buser. He was clearly passionate about not just the restaurant, but the atmosphere, the food, and the people (staff and customers). His attitude was infectious as his staff was equally as attentive and informative. My man Michael Chambers (pictured with me below) really took care of me and gave me the scoop on many of the dishes. Crispy Risotto Bites (appetizer) – A bite-sized blend of Italian cheeses and rice, lightly fried and served with marinara sauce. Artichoke Fritti (appetizer) – Artichoke hearts lightly battered and fried, topped with Italian cheeses. Served with citrus aioli dipping sauce. Spicy Calabrian Wings (appetizer) – Chicken wings tossed with garlic and chili peppers from the Italian region of Calabria, served with gorgonzola dipping sauce. Mediterranean Flatbread (appetizer) – Basil pesto and olive oil, topped with a blend of four Italian cheeses, artichoke hearts, olives, capers, roasted red peppers and garlic. Roasted Tomato Caprese Salad Topper (salad) – Fresh mozzarella bites, roasted tomato, bell pepper, basil, kale and an extra-virgin olive oil drizzle. Salmon Bruschetta (entree) – Grilled filet topped with fresh tomatoes and basil pesto. Served on seafood risotto with sautéed shrimp. Citrus Chicken Sorrento (entree, Lighter Italian Fare, under 575 calories) – Tender, grilled chicken breasts in a citrus honey glaze, inspired by the Italian city of Sorrento, famous for its lemon groves. Served with lightly seasoned broccoli, artichokes and roasted vegetables. Northern Tour of Italy (entree) – Asiago tortelloni with meat sauce, Chicken Lombardy and fettuccine with creamy parmesan portobello sauce. Add a topping (additional cost): Meatballs, Italian Sausage, Chicken Meatballs, Grilled Chicken, Sautéed Shrimp. Pappardelle Pescatore (entree) – A traditional, coastal Italian dish with sautéed shrimp, bay scallops and clams tossed in a creamy, red pepper seafood sauce. Served with fresh asparagus, tomatoes and pappardelle pasta. Apple Tuscan Bread Pudding (seasonal dessert) – Warm, rustic Italian bread pudding baked with York Imperial apples, then topped with caramel and rich vanilla cream. My personal favorites? The Risotto Bites were a great kickoff to the meal. I also deeply enjoyed the wings which had the right hint of spicy but weren’t too hot. Outside of appetizers, I truly enjoyed the Salmon Bruschetta and the Northern Tour of Italy. And, of course, the famous Olive Garden bread sticks – which I tried for the first time with a splash of alfredo sauce. Yum. To top it all off? I won a gift card while tweeting out some of the photos below. My takeaway from the event was simple. The Olive Garden has something for everyone, and is an incredibly comfortable place to dine no matter the size of your party. One of the things that Greg (the general manager) said stuck out to me – he said that his goal was to make his restaurant the best place to work and the best place to eat. Having spent a few hours there and given the opportunity to see his staff at work, I would say that an argument can definitely be made in his favor. 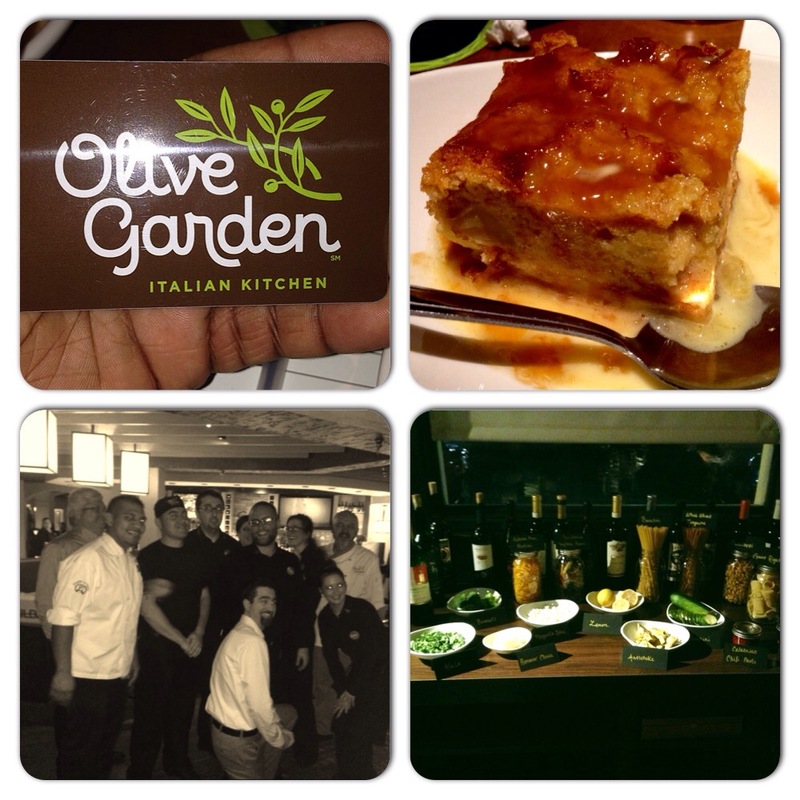 But don’t take my word for it – go check out the Olive Garden experience for yourself. Disclosure: I did receive complimentary food and beverage during my visit. However, I was not compensated for this post. My words and thoughts are my own.